Welcome to the new morning post concept, which I’ve decided to call “The Cooler.” It works on three levels (in my head), but I’m not going to explain them because there’s nothing worse than explaining why you think you’re clever. Normally in this space, I’ll hit a bunch of topics rapid-fire — things you might have missed, things to make you seem smart when talking to your friends, etc. Let’s unpack the weird mess that is the Karl-Anthony Towns situation. That he and the Wolves are “not in a good place internally” (Lowe) and that “I don’t think Anthony Davis is going anywhere any time soon. But Karl Towns … now that might be a different story” (Windhorst). Both kind of left it at that or even walked it back a little later on, but the Internet was having nothing of nuance. *The chatter — two plugged in guys talking — was deemed a “report” by numerous outlets. Bleacher Report at least had the requisite amount of perspective in their short, often retweeted item. Zach LaVine, a former teammate of Towns with the Wolves, saw the BR item and replied on Twitter with the “look at that” eyes. Around the same time, the Suns’ Devin Booker — Towns’ teammate at Kentucky — tweeted a picture of Karl in a Suns jersey. And Wolves fans pretty much lost their minds at that point. *This is the point where I usually shake my finger and say, “Guys, this is how lame rumors get started. 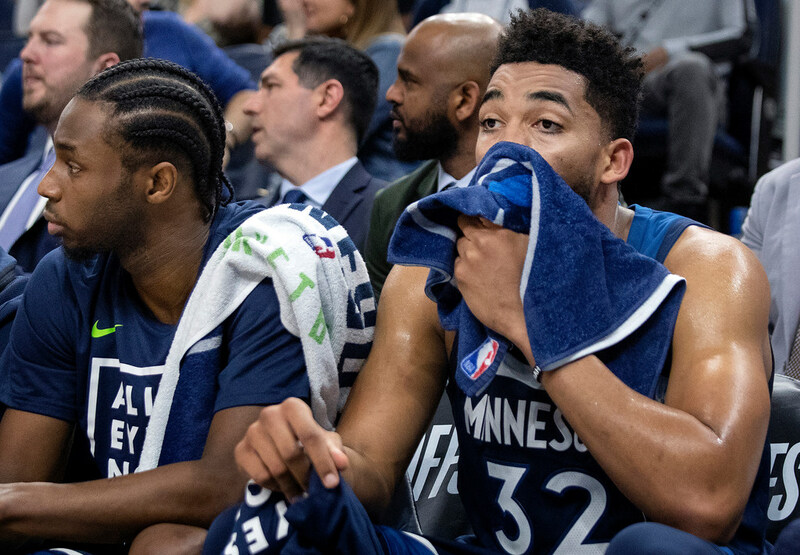 Nothing is going to happen.” Towns has very little leverage, and the Wolves can offer him way more in a contract extension this summer than any other team will be able to offer. Emerging stars coming off rookie deals don’t turn down these big extensions. Just doesn’t happen. And the Wolves would be crazy to trade Towns. He was an All-Star last season, and anything good you can imagine happening in the next five years involves him. *All of that is true. But at the risk of sounding like Stephen A. Smith … HOWEVER: While the notion of a Towns trade is highly improbable and almost laughable, the idea that he and the organization are not in a good place internally is not so laughable. Someone, maybe multiple someones, have seemingly indicated that’s the case to the extent that Lowe felt comfortable saying it on a podcast. We don’t know where he got his information or how close the source was to Towns. And it doesn’t mean that if there is damage it can’t be fixed. But Towns does play for a demanding coach, and he did have his franchise role at least diverted into a 1 and 1-A status with the arrival of Jimmy Butler. It’s plausible he’s not happy. We also shouldn’t just laugh off the fact that LaVine and Booker jumped into the fray on Twitter. Those are former teammates — guys who presumably know Towns well. If this is some sort of orchestrated thing — how millionaires in their young 20s execute a power play — it’s worth noting. *Towns himself could have shut all of this down, but he’s been silent — including on Twitter and Instagram. He’s intelligent and self-aware. He knows this is being talked about. Maybe he’s not acknowledging it because acknowledging something validates it and he doesn’t think it’s worth his time. Or maybe he doesn’t mind this type of info being floated out there. *At the end of the day, there seems to be some smoke here — but not as much as you might think given the Internet wildfire that occurred over the weekend. The best way to leave it is this: What already was shaping up to be an interesting and important offseason for the Wolves is now a little more interesting and important.